Crispy almond flour and pecorino cheese crusted tilapia with low carb veggie couscous. 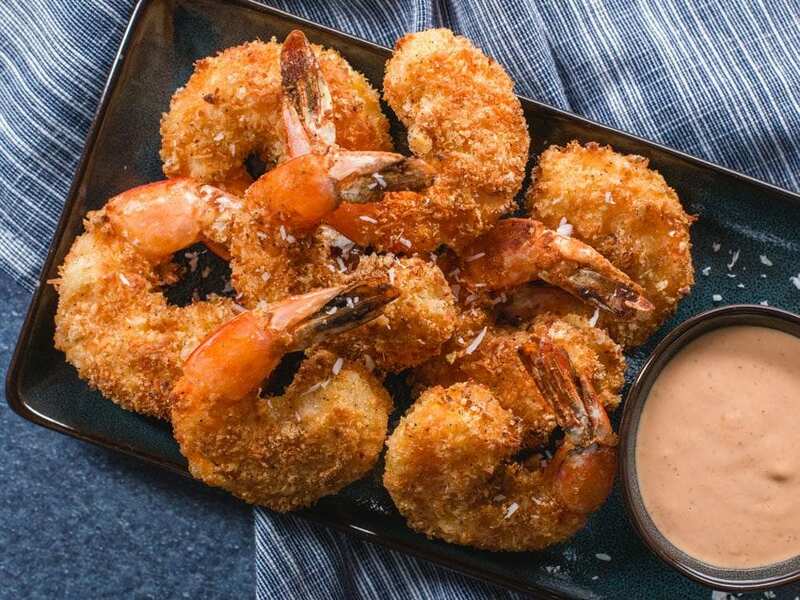 The perfect keto seafood recipe that only uses 6 fresh ingredients. 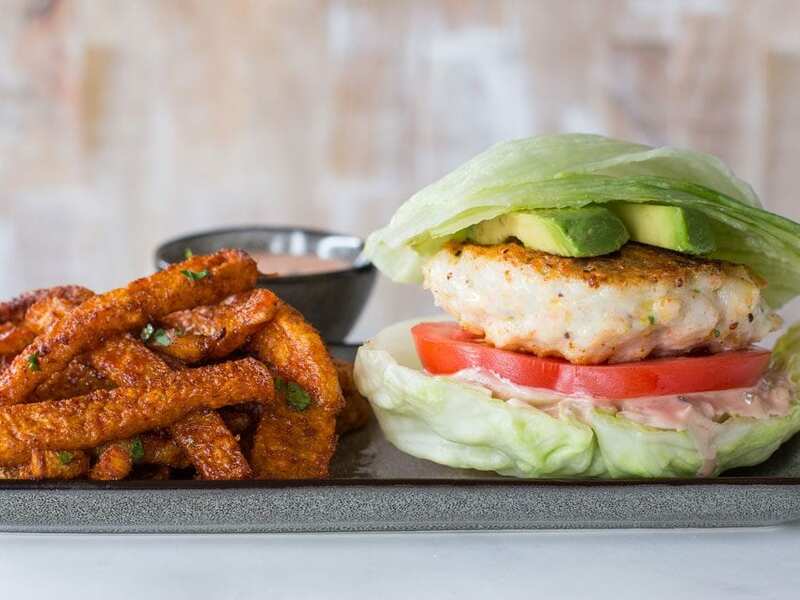 You guys have been asking for keto seafood recipes, so I thought I would hook you up with a tilapia recipe that only has 6 fresh ingredients! 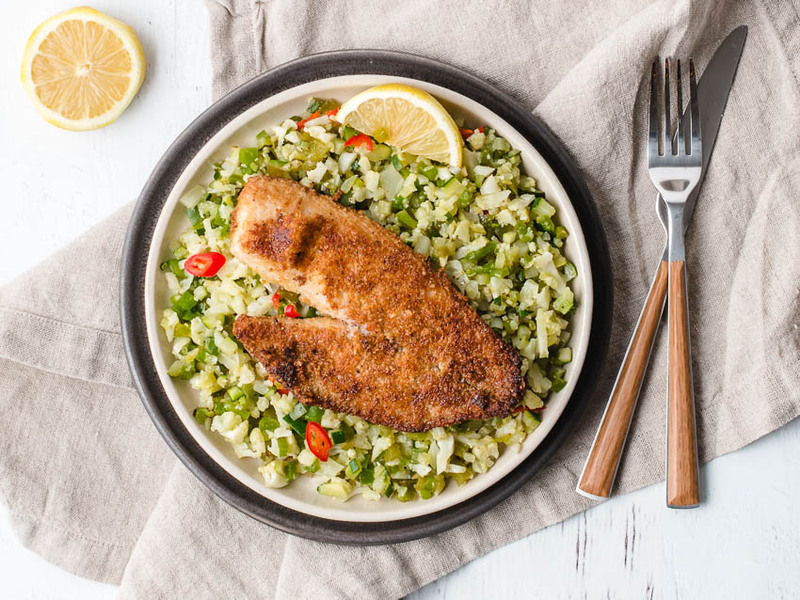 The key to making this tilapia crispy and low carb is using seasoned almond flour and grated pecorino romano cheese. 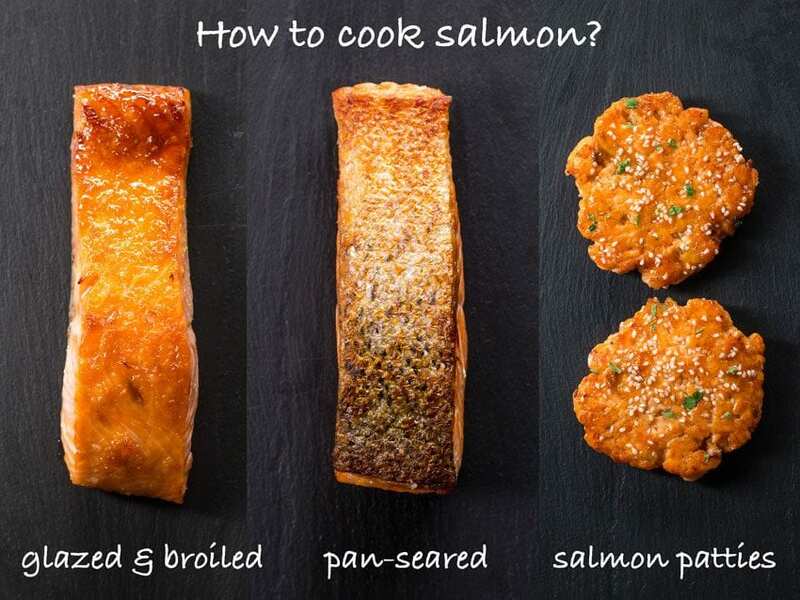 No flour or starch needed – just fry the fish up in a bit of olive oil or avocado oil and you are set. 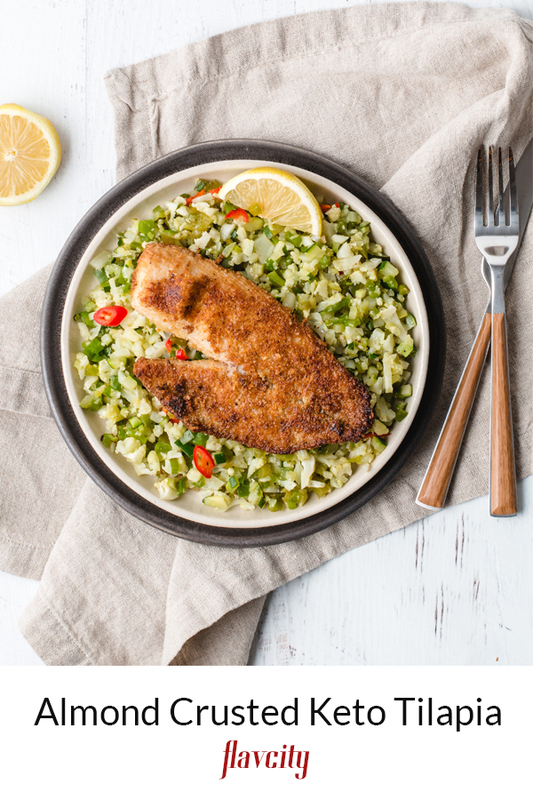 Serve the tilapia with keto veggie couscous made from cauliflower, zucchini, and green peppers. This post is a collaboration with my buddies over at Thrive Market. 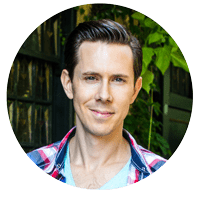 I have worked with them on many YouTube videos because they make healthy living easy and affordable for everyone. Instead of buying your favorite organic, all-natural, and non-GMO products at the grocery store, you can get them for up to 30% cheaper on Thrive Market! Best of all, you don’t have to leave your house as the Thrive box of goodies is delivered straight to your front door – and its cold in Chicago now! They hooked you guys up with a sweet promo code to get 25% off your first order – that’s on top of the already big savings and a free 30 day trail. I even created the FlavCity budget bites page on their website. It is some of my favorite healthy products that won’t break the bank, so make sure to check that out. The best way to make low carb crispy coated tilapia is by using fine almond flour. It is the best keto ingredient for dredging and frying food. You could also use coconut flour, but it does not get as crispy. Season the almond four with onion powder, garlic powder (Thrive market as terrific organic spices), lemon zest, along with salt and pepper. First rub some olive oil on the tilapia and season with salt on both sides and then place in the almond flour. Make sure to pack the coating on both sides of the fish and then fry in a shallow pan with a bit of oil. The tilapia only takes 3 minutes each side, or until golden brown. It’s best to move the cooked tilapia to a wire rack set over a sheet tray so the excess oil can drip away. 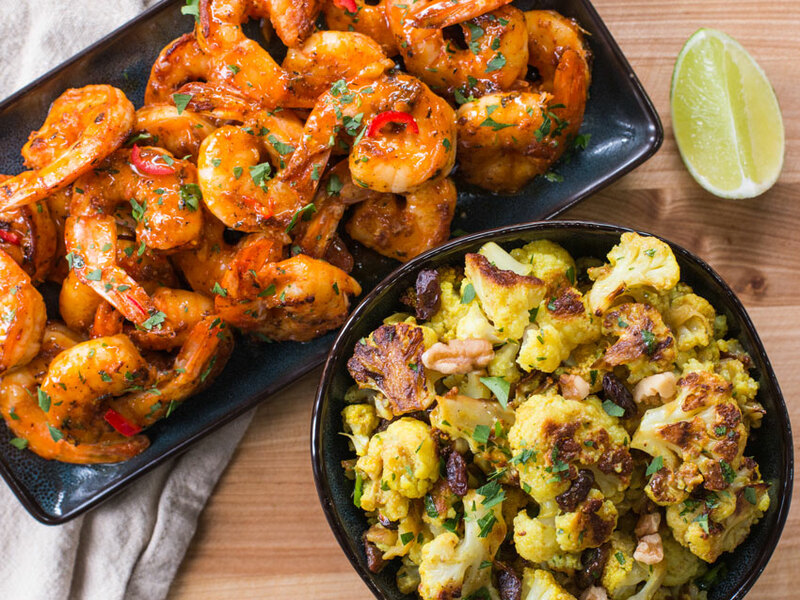 Can You Fry With Almond Flour Or Coconut Flour? Both almond flour and coconut flour can be used as a low carb breading for frying but almond flour is better. Almond flour will get more crispy than coconut flour and won’t soak up as much oil since is not as dry. You may need to change the oil more frequently as the almonds tend to burn easily at the bottom of the frying pan. It’s easy to turn veggies into couscous. Just finely cut fresh cauliflower, green peppers, and zucchini. The veggies have the same look and feel as starch couscous, but none of the carbs. Since the recipe only has 6 fresh ingredients, I wanted to re-use the onion and garlic powder to season the couscous. If I had more veggies I would saute some onions and garlic before adding the veggies to the pan. You only need to cook the veggies for 5 minutes. Otherwise they will get soft and mushy. Since we are going for a couscous texture, it’s nice if they veggies still have a bit of bite left to them. Finish the couscous with lemon juice, remember we used the zest for the fish, and you are done! Can you use almond meal or does it have to be almond flour? Thank you. 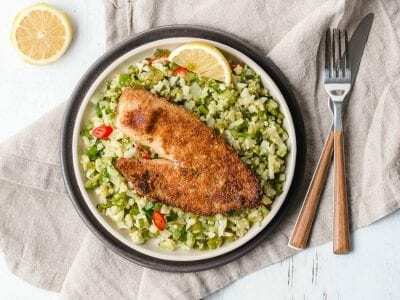 For this fish recipe you COULD use almond meal, but I’d rather keep almond flour on hand as it is more versatile: to use for this dish as well as in baking recipes. Hi there where can I get that t shirt? Hard to say….. It was from a local Chicago store and I don’t remember where at this point. What is your reasoning for using tilapia? From what I understand is that all tilapia is farm raised and full of toxins. I don’t use tilapia often, but when I do, if you buy good quality, farm raised tilapia from a reliable source like Whole Foods, it’s actually okay.